If a celebrity doesn’t make this declaration at least once a decade, they will actually wither and die. As we all know, celebrities are amongst the wisest people on the planet. Lady Gaga is, quite possibly, the wisest of them all. That explains how she knows that divorce is not an option for her. Even though she’s not married. Read about it here. 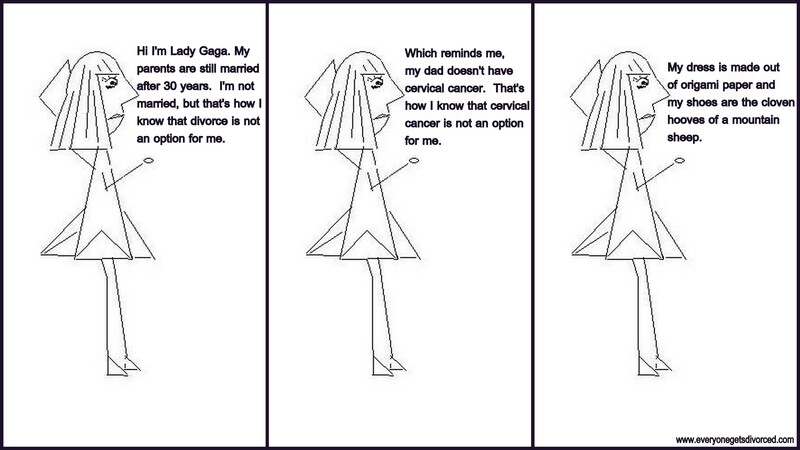 We were so inspired by her beautiful, wonderful logic that we decided to capture it in comic strip form. This is your funniest post yet. Based on her understanding of the word “option” it seems possible that she actually meant she finds monsters terrifying. Good luck with that Gaga.